WOW I came across this recipe and HAD to try it, I changed it a little bit to fit what I had in the house but its pretty darn tasty! 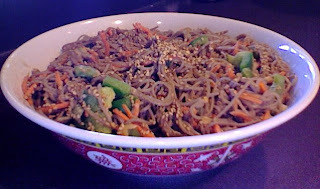 I always have Buckwheat Soba but, was rather upset to find out my Sesame and Peanut oil had gone bad, I threw in a small amount of olive oil in its place. I had no green onions so, no onions PLUS, oldest daughter would pick them out anyway! I am the queen of adapting recipes to fit what I have in the house, obviously Peanut Butter could not be substituted too easily but, I am sure someone out there has done it with soy or almond butter. Cook Soba Noodles according to pkg. directions, rinse with cold water and drain. Mix Peanut Butter, Soy Sauce, Garlic, Water, Rice Vinegar, Honey and Oil, stir well. Toss sauce mixture into noodles and add carrots, peppers and onions, let cool, then refridgerate and serve! This makes a nice main dish meal with the addition of a asian salad or would be a great side dish to grilled steak or chicken.